The X-Files: Colonization is spread over four dual-layer discs, all episodes presented in excellent 1.78:1 anamorphic widescreen transfers that are only slightly below the reference quality imagery of sister series Millennium’s second and third seasons. The third volume of The X-Files Mythology DVD, entitled Colonization, resolves several of the show’s major storylines, specifically through the destruction of the Syndicate (a secretive cabal of men working with the series’s even more elusive aliens to bring about the colonization of Earth) and in answering the lingering questions concerning the disappearance of protagonist Fox Mulder’s (David Duchovny) sister Samantha. 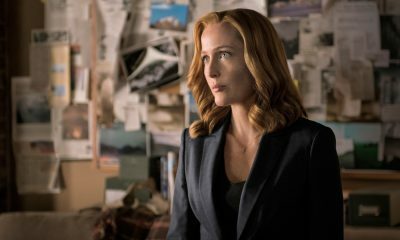 Whereas the previous Black Oil set focused more specifically on co-lead Dana Scully (Gillian Anderson), paralleling the amorphous alien life force of the title with the nasopharyngeal cancer that nearly killed her, the Colonization set turns its concerns to Mulder and the general ineffectualness of his quest to bring the truth to light. I’ve come to view Mulder (much as I do X-Files creator Chris Carter) as a macro pessimist, a man so overwhelmed by an unknowable big picture (call it God, the Universe) that he becomes, conversely, a micro optimist, someone obsessed with the grunt work and minutiae of everyday life. The work is what sustains him, even if his efforts foster little actual change. It’s therefore unsurprising that Mulder is only an aftermath witness to the Syndicate’s fiery demise in “One Son” or that his sister (sworn by many of Mulder’s scheming acquaintances to be alive and well) turns out to have died long before he even discovered the X-Files. 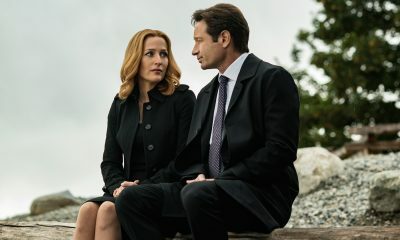 Especially in the latter case Mulder’s cathartic encounter with the deceased Samantha in “Closure” is portrayed from a fittingly cold and intellectual distance (I waver back and forth on how emotionally effective it is), though it gains layers of resonance depending on one’s familiarity with the mytharc and its participants, most tellingly with the character of the Cigarette Smoking Man (William B. Davis) whose manipulations become increasingly and appropriately pathetic over the course of the collected episodes. The X-Files: Colonization is spread over four dual-layer discs, all episodes presented in excellent 1.78:1 anamorphic widescreen transfers that are only slightly below the reference quality imagery of sister series Millennium’s second and third seasons. The set offers closed captions and a choice of English, Spanish, or French surround audio tracks along with optional English and Spanish subtitles. Six audio commentaries grace the Colonization set: participants include series creator Chris Carter, director Kim Manners, writer/producer Frank Spotnitz, and actor Robert Patrick. Five are solo commentaries of sporadic interest (Carter’s on “The Red and the Black” and Spotnitz’s on “One Son” being the insightful best) while the sixth, on “Within,” is an entertaining dual-header featuring Manners and Patrick, the latter introduced in the episode as Special Agent John Doggett. The documentary “Threads of the Mythology: Colonization” features interviews with various behind-the-scenes X-Files personnel; most welcome are Spotnitz’s comments which help to clarify the origins and purpose of the show’s various alien races. An exclusive collectible mythology timeline is also included.